I'm revisiting the crop top!! I wore one during summer, but I saw so many girls rocking it at NY Fashion Week that I just had to do it again! I'm wearing: Lulu*s crop top, Helen Wang midi skirt from Bluefly, Zara heels, vintage Levi's jacket, Michael Kors sunnies. 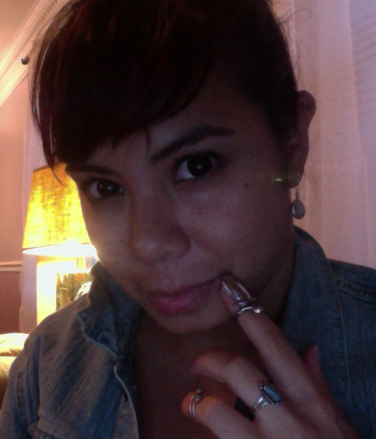 Jewelry includes earrings from Anthropologie, necklace from my mom, nail ring from Etsy store Mintloft. That's right, I've bought into the nail ring trend! Mostly because I got a super cheap one from Etsy... it's kinda fun but if I wore it out for a girls' night it would surely get lost. I really like the idea of balancing out a crop top (NO belly button please) with a midi skirt for fall. Would you try the look? ?